We just downloaded Judo last week so I could figure out how to program. Today I decided to make a spot making program. 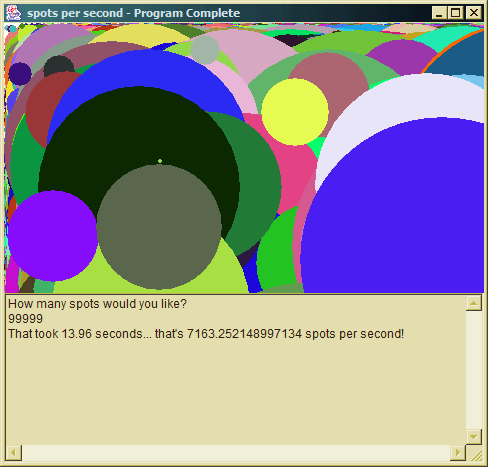 Mary asked for 999,999 spots and it took a long time, so I wondered how many spots my program could make per second. So at first we just tried counting and calculating, but then I realized that we could use a timer instead. Well, maybe Java isn’t perfect, because we got some pretty funny results! I don’t think this is accurate! What I got ... INFINITY spots per second?